It just gets better every week! 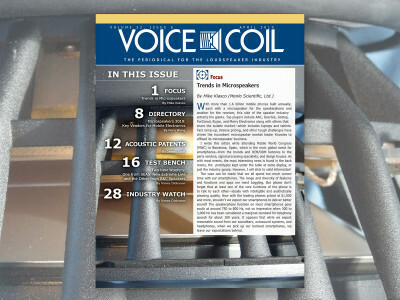 Our weekly newsletter - The Audio Voice - was created to address the interests of both audioXpress and Voice Coil readership communities. Regular industry news and trends, product design and new technology highlights, trade-show calendar, magazine updates and much more, now directly to your inbox. Register now and read past issues. 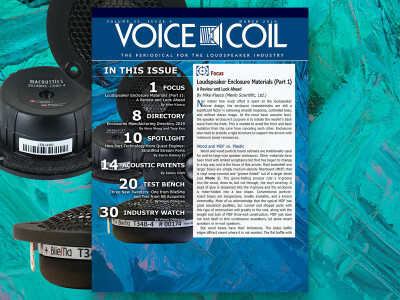 Our weekly newsletter - The Audio Voice - addresses the interests of both audioXpress and Voice Coil readership communities. Industry news and trends, product design and new technology highlights, trade-show calendar, magazine updates and much more, directly to your inbox. The Audio Voice 108 #Week47 - Audio Innovations to Watch in 2017! The Audio Voice 109 #Week48 - Audio Innovations Continued, Current-Driving of Loudspeakers, MusicScope. The Audio Voice 111 #Week50 - The Return of Analog Synths - Loudness - Eminence Maverick! The Audio Voice 112 #Week51 - Bluetooth 5 for Audio Applications in Perspective | Scan-Speak. The Audio Voice 113 #Week52 - Even EarPrint Personalized Listening. On the way to CES2017. The Audio Voice 116 #Week04 - Guest Editorial - MQA Streaming on Tidal. News from NAMM 2017! The Audio Voice 117 #Week05 - NAMM 2017 and the Pro Audio future. The Audio Voice 118 #Week06 - Soundchip. Smartphone Apps for Measurement. The Audio Voice 119 #Week07 - Integrated Systems Europe 2017 Report. CLIO Pocket User Report. The Audio Voice 120 #Week08 - Why MQA is Good for Music. CanJam NYC Impressions and more. The Audio Voice 121 #Week09 - MWC 2017 Report on Audio Development for Mobile Platforms. The Audio Voice 122 #Week10 - Is Voice Our Best Friend? More about MWC 2017. The Audio Voice 123 #Week11 - Embedded World 2017 and Embedded Audio Things. The Audio Voice 125 #Week13 - A Sort of Prolight+Sound 2017 Preview. Bozhen Ribbon Tweeter. The Audio Voice 126 #Week14 - Prolight+Sound 2017. Guest Editorial: Enhancing Headphone Comfort. The Audio Voice 127 #Week15 - Prolight+Sound 2017 Impressions. Sound Cards for Audio Measurements. The Audio Voice 128 #Week16 - AoIP meets VoIP and Everything over IP at NAB. SOTA Applications. The Audio Voice 129 #Week17 - Impressions from Axpona 2017. Boundary Effects on Speakers. The Audio Voice 130 #Week18 - Streaming Rules. Genelec Introduces The Ones. The Audio Voice 131 #Week19 - Amazon Watches for You with the Echo Show. Tang Band Tweeter. The Audio Voice 132 #Week20 - From mp3 to MQA. B&C Speakers 8NSM64 Midrange. The Audio Voice 134 #Week22 - The Intriguing Case of the Analog Tapes. Eco Power Supply. The Audio Voice 136 #Week25 - InfoComm 2017 Impressions. Hybrid Valve MOSFET SE Amp. The Audio Voice 141 #Week30 - Let's Talk about Headphones. MEMS Microphones. The Audio Voice 142 #Week31 - How to Make Sure Clients Buy Your Headphones? Vesper MEMS. The Audio Voice 143 #Week32 - Personal Headphone Responses. Great Sounding Tube Radios! The Audio Voice 144 #Week34 - The State of Play. Kanoa. Even Earprint. Dayton Audio. The Audio Voice 145 #Week35 - Stretchable Cables. Mobile Testing. The Audio Voice 146 #Week36 - IFA 2017. Practical Applications for SPL Meters. Fibona Acoustics. The Audio Voice 148 #Week38 - IBC 2017 IP Showcase. Mini Single-Ended Amp. B&C 6MBX44 MBX. The Audio Voice 150 #Week40 - Wearables Around-The-Neck. SB ACoustics. Vienna Suite Pro. The Audio Voice 152 #Week42 - Innovation and Marketing Cycles. Mojo Maestro. Simulation Software. The Audio Voice 155 #Week45 - The Latest on MEMS. Accuton Ceramic Tweeter. The Audio Voice 156 #Week46 - Futuresource Audio Collaborative 2017. ETON 29HD2 Tweeter. The Audio Voice 157 #Week47 - The Egg Speaker Project. Loudspeaker Modeling Files. The Audio Voice 158 #Week48 - More Graphene Developments! Willow Preamp Revisited! The Audio Voice 159 #Week49 - Language Frontiers for Voice Applications. OPPO Digital UDP-205 Review! The Audio Voice 160 #Week50 - True Wireless Stereo Earphones! Portbale Tube Preamp. The Audio Voice 162 #Week52 - True Wireless Challenges Part 2. NFMI. SEAS 6.5" King Coax! The Audio Voice 164 #Week03 - ALMA AISE 2018 Awards. What Really Happened at CES 2018? The Audio Voice 166 #Week05 - NAMM 2018 First Impressions. Preamp Muting Circuit. The Audio Voice 168 #Week07 - Apple HomePod? A 30-Inch Woofer from 1975. The Audio Voice 169 #Week08 - NXP. Microphone Calibration. SB Speaker Kits. The Audio Voice 170 #Week09 - Connected World Congress 2018. Volt VM752. Simply Sound Co SS-1. The Audio Voice 171 #Week10 - Interview with Bragi. Scan-Speak. Peter Delos Tube Preamp. The Audio Voice 174 #Week13 - Audio Opportunities. Turntable Speed Control. Peerless by Tymphany Neodymium Full Range. The Audio Voice 176 #Week15 - Hearables Part 1. Tube Types. Physical Lab. The Audio Voice 181 #Week20 - High End 2018 Report. G.R.A.S. RA040X Ear Simulator. The Audio Voice 182 #Week21 - The AirBlade Transducer. Repairing Switching Mode Power Supplies. The Audio Voice 183 #Week22 - AES 144 Milan. Precision Devices. Driver-Induced Vibrations. The Audio Voice 184 #Week23 - T.H.E. Show! IK Multimedia ARC 2.5. The Audio Voice 185 #Week24 - InfoComm 2018. ARC 2.5 MEMS Microphone. AISE 2018 Compilation. The Audio Voice 186 #Week25 - Vinyl is Cool. Virtins Multi-Instrument. Precision Devices. The Audio Voice 191 #Week30 - ISE 2021 Moves to Barcelona. ARTA. Millett SE E-Linear Amp. The Audio Voice 193 #Week32 - Software Music Players P2. Axpona 2018. B&C Speakers DE360-8. The Audio Voice 194 #Week34 - Neodymium P1. Sonarworks Room Calibration. BlieSMA Tweeter. The Audio Voice 196 #Week36 - IFA 2018 Report. Amp Sound 2. B&C Speakers DE680TN. The Audio Voice 197 #Week37 - CEDIA 2018 Report. Habitat Soundscaping. A Visit to SoundChip. The Audio Voice 198 #Week38 - IBC 2018 Show Report. Radian Compression Drivers. Mixing and Mastering. The Audio Voice 199 #Week39 - IBC 2018 Report on AoIP. Electron Tubes Book. Radian Compression Driver. The Audio Voice 201 #Week41 - Headphone Market and Technology. Axign Controller. FaitalPro Woofer. The Audio Voice 202 #Week43 - Hearables and AR. Tang Band Mini-Sub. Tipton Mic Preamp. The Audio Voice 203 #Week44 - Highlights from 145th AES NY. Eminence Midbass. Moving Coil RIAA Preamp. The Audio Voice 205 #Week46 - Audio Collaborative 2018. D'Appolito Measuring Low-Frequency Response. B&C Speakers. The Audio Voice 206 #Week47 - The Music Cassette Is Back. LabNation's SmartScope. Dayton Audio DSP-408. The Audio Voice 207 #Week48 - Neville Roberts Recording Techniques. Dayton Audio Epique E160CF-8. Artnovion Sub Bass Trap. The Audio Voice 208 #Week49 - Adobe Durin Gleaves. ANC Headphone Test. Dayton Audio Dome Tweeters. The Audio Voice 209 #Week50 - Audio Collaborative 2018 Live Sound. THAT's Balanced Line. Soundbar Audio Signal Processing. The Audio Voice 210 #Week51 - Audio Collaborative 2018 Music. USB-C and Thunderbolt. Peerless by Tymphany Mini Full-Range. 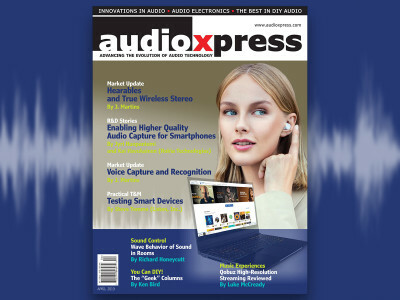 The Audio Voice 211 #Week52 - Consumer Audio Highlights 2018. Bohdan Raczynski. B&C Speakers 12FCX76 Coaxial. The Audio Voice 212 #Week01 - Professional Audio Highlights 2018. Subwoofer Placement in Odd-Shaped Rooms. Wavecor Subwoofer. The Audio Voice 214 #Week03 - CES 2019 First Impressions. Smart Speaker Designs. BMS 4507ND Dual Diaphragm. The Audio Voice 215 #Week05 - NAMM 2019 First Impressions. Predictive Acoustics. Dayton Audio RS180P-8 Midwoofer. The Audio Voice 216 #Week07 - ISE 2019 First Impressions. Korg Nutube 6P1. Punktkilde FSB611015-1400. The Audio Voice 217 #Week08 - Networks Expanded. Bose Modeler. Punktkilde FSA621520-2300. 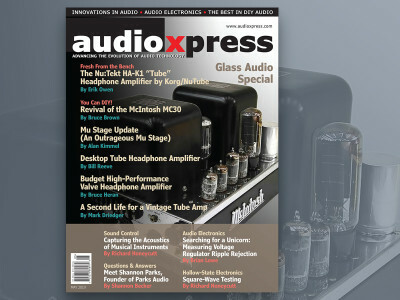 The Audio Voice 218 #Week09 - Two Perspectives on Hi-Fi. CATT-Acoustic. SEAS Excel T35C002 Tweeter. The Audio Voice 219 #Week10 - MWC 2019. EASE. Celestion AN2075 Array Driver. The Audio Voice 220 #Week11 - AISE 2019 Promo. DUMAX/Klippel. Eighteen Sound ND4015BE Be. The Audio Voice 221 #Week12 - Questions About USB 4. Remember High End 2018. Celestion CDX14-2420. The Audio Voice 222 #Week13 - JEC World 2019. Attenuators for Measurement. Radian 745PB. The Audio Voice 223 #Week14 - Neville Roberts' Rockets to Recordings. CC for Tube Heaters. Materials for Headphones. The Audio Voice 225 #Week15- Voice for TWS Earbuds. Geoff Hill Book Review. Radian 475PB. The Audio Voice 226 #Week16 - Attending Trade Shows. Lepai LP40PA. Eminence SD28 Tweeter.